Success and wellbeing are things that everyone looks for. In this post, Sadhguru looks at how yantras are devices that can aid an individual in finding success, health and wellbeing. Success and wellbeing are things that everyone looks for. Each of us may have individual ideas of what success is and follow different routes to wellbeing, but the underlying desire is the same. This was recognized in ancient Indian culture, and so, yogis and mystics down the ages created many devices to aid human beings in their quest for immediate and ultimate wellbeing. Yantras are devices of this kind, which are created as support systems towards a particular purpose. యంత్రాలంటే ఏమిటి? అవి నాకు ఎలా ఉపయోగపడతాయి? Question: What exactly is a yantra? Sadhguru: A yantra literally means a machine. A machine is a combination of very purposeful forms. For example, a computer is a product of our minds, but still, if we are asked to multiply 1736 with 13,343, we reach for a calculator – a yantra. It is not that the calculation is not possible in the mind, but this purposeful form or yantra allows us to use our body in a much better way. Even though you already have the body – the most sophisticated yantra – with you, it is possible to perform different types of activities better with specific machines for those activities. The process of building temples was fundamentally to create a powerful yantra for everyone. But maintaining many public spaces has become difficult in today’s world, so more private things are being created. Question: What benefits does being in a yantra’s presence bring? Is it only for the spiritually-inclined or are there more material benefits? 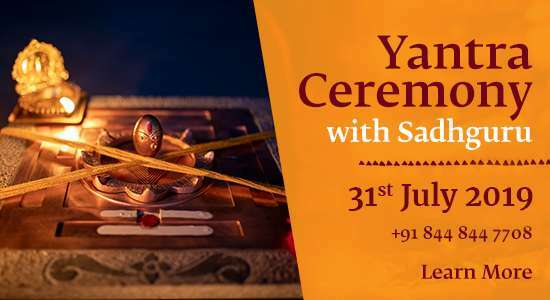 Sadhguru: Yantras are tools to enhance our life in different dimensions. They are made for specific purposes and different types of yantras reverberate in different ways. Looking at the kind of energy that is to be created, we can create that kind of yantra. The most basic yantra is a simple triangle. An upward facing triangle is one kind of yantra, a downward facing triangle is another kind. You can mix them in many different ways and make a variety of yantras. Whatever you do, you can do it much better with the assistance of the Bhairavi Yantra. It is for those who are actively involved in businesses, careers and family life, and want to do many things in the world. For example, the Bhairavi Yantra is meant for the enhancement of one’s wellbeing. Whatever you do, you can do it much better with the assistance of the Bhairavi Yantra. It is a very powerful, personalized tool that creates a certain space and an atmosphere so that your wellbeing is naturally taken care of. It is for those who are actively involved in businesses, careers and family life, and want to do many things in the world. One of the main things that does not allow a human being to find his full potential is friction. Friction need not necessarily mean that you get into a fight with someone. But when you try to be active in a big way, it builds up around you. How low friction levels are kept determines how far you will endure. If friction increases, you will want to stay away from activity or you will get into one big mess. It does not matter how important a certain goal is for you, if friction happens every day when you step out and try to do something, you will slowly develop an aversion to that very dear goal of yours. I would say 80% of human beings have hugely curtailed the possibility of what they could do in their life simply because they cannot deal with the friction they naturally generate when they get into brisk activity. It is not a very smart way to deal with it because instead of bringing lubrication, you are keeping the engine off. We have created the Bhairavi Yantra for those who want to lubricate their actions with the Grace of the Devi so that you can take up things and not get into friction. Her Grace will take care of that. Question: Linga Bhairavi offers two yantras. You spoke about the Bhairavi Yantra. How is the other one – the Avighna Yantra – different? Sadhguru: Essentially it is just one. The other one is just a question of size. We estimated that if the homes are anywhere between 2000-2500 sq. ft., the Bhairavi Yantra would do. For homes larger than that, we said this is not enough and we offered the Avighna. Avighna also has a slightly more business-like attitude towards it, more for success and prosperity. Whatever a human being is trying to do, there are always various obstacles. Whether one is able to cross the obstacles or not is the measure of success that one has in one’s life. Avighna Yantra is designed to bulldoze the obstacles in one’s life. It is a certain form that takes the obstacles away. Of course, those who want to make use of it for spiritual processes can always do that. That is always the basic element. The idea is to create assistance for people in whatever they want to do. So the Avighna is for a variety of things. There is a basic spiritual element but if you don’t care about spirituality and you just want to make money, the yantra will lubricate your engine. Where you want to drive your car is up to you. Question: Traditional yantras often have the symbol of a bindu as the central point. However, on the Linga Bhairavi Yantra, there is a linga in the center, which gives the yantra a unique characteristic. Why did you design it that way? 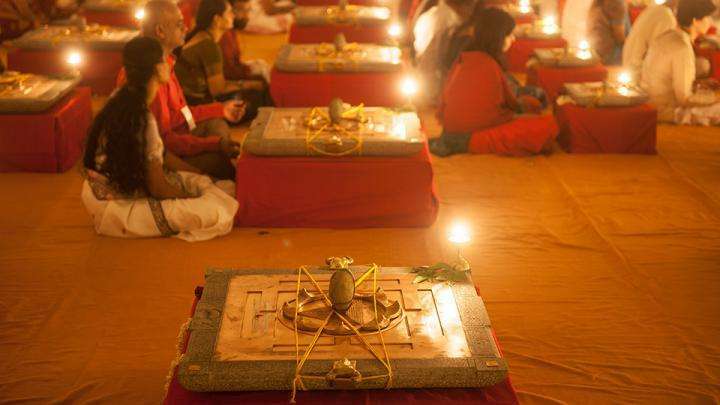 Sadhguru: A Linga Bhairavi Yantra is not in any way symbolic – it is a purely geometric pattern. A yantra is a machine – it has to work, function and deliver something. Every machine is essentially only an enhancement of a faculty that we already possess. We can walk, but with a bicycle we can move much faster. We can speak, but with a phone we can talk much further. The Linga Bhairavi Yantra is existentially functional. It fulfills specific purposes and delivers a certain activity or competence. This yantra is a complex arrangement of forms. The copper plate is just the foundation. 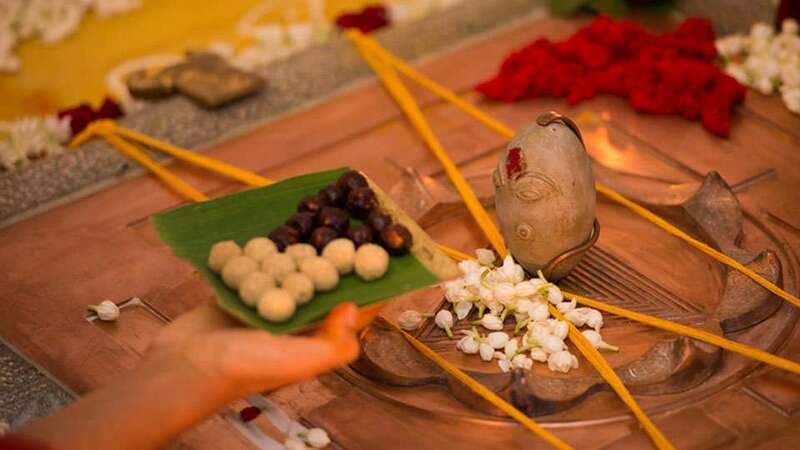 A bindu is a symbolic representation of the original form, which we know as ellipsoid or linga. When you see a bindu in a larger arrangement, and it is shown as a simple dot, it is just an unarticulated ellipsoid or linga. 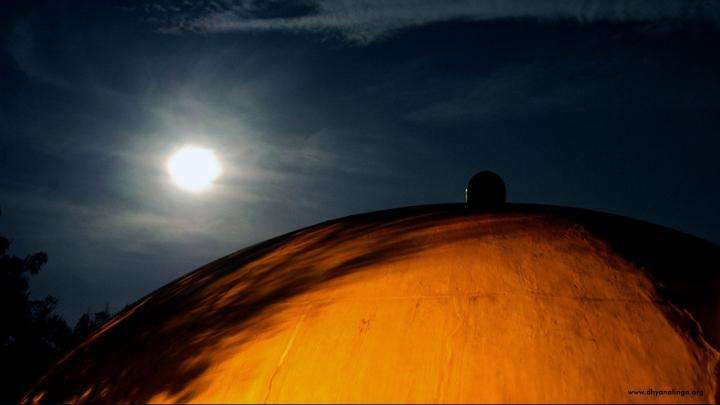 To put it the other way around, the linga is a more articulated expression of the bindu. With the Linga Bhairavi Yantra, it is very articulated. The Linga Bhairavi Yantra functions the way it does mainly because of the shape of the linga and the nature of the material. Most of the “software” of energy is written in the linga. The remaining parts of the yantra are more like foundation, which also has a certain amount of software, but only software of stability. If you create enormous power from any substance or any form, it will dissipate itself unless you create a proper foundation of stability. If that stable atmosphere is there, it can reverberate in a big way. It can energize homes and people in a phenomenal way and still not dissipate over a period of time. If you pass down your Bhairavi Yantra five, six, or ten generations, it will still live. Namaskaram Sadhguru, I want to have a Avigna Yantra from your hand. I have a linga bhairavi gudi in my apartment and I am very happy about it. I am not sure whether my living style may be conducive for maintaining Avigna Yantra. I work as a AVP/ Director in a IT company and I have to travel 4 to 5 days a week out of station, for about 6 to 8 months in a year. I have chosen to stay as bachelor (there is no one at home, I am living alone literally) and I don't see myself getting a companion or spouse in this life. The way people are describing the process of compulsory daily aradhana and offering food to Yantra is worrying me. I cook food once a week and keep in refrigerator and surviving. I don't know where I will be on a Full Moon day or New Moon day, because of my work. Thankful if you can please advise whether a bachelor like me, with the kind of traveling life I lead, can have a Avigna Yantra. I have a 4 BR (about 2500 sq ft) home. Namaskaram and looking for your advice. The people receiving yantras are not hungry or desolate. They are all well off and have all the basic necessities they need for a living. Instead of working their way up to enlightenment they have been dragged to Yantra worship. This baffles me!. I have a Gudi and other Yantras and feel blessed. Our office has Avighna Yantra in the entrance blessing all the employees. It is so wonderful. Pranams Sadhguru. It would have been better if you could relate it as a metaphor. People who are stuck with the hunger of the worldly needs cant jump into spiritual path out of the blue. Spiritual path is a huge responsibility and when you take a plunge you need a level of comfort in your daily living and survival. The yantras are meant to be a catalyst in getting the basic needs organised. When the mind isn't distracted it becomes an opportunity to walk the spiritual path. Namaskaram Shankar, it is best you talk to the concerned people about it.pls mail to yantra@ishafoundation.org or yantra@lingabhairavi.org. They will give you more details, i do have a yantra it is making a huge difference in my life..!! "People who are stuck with the hunger of the worldly needs" you say. So you distinguish between 'worldly needs' and 'basic needs'. First one is a 'want' and second one is a 'need'. People on the spiritual path I thought value needs more than wants and are happy once their needs are met. 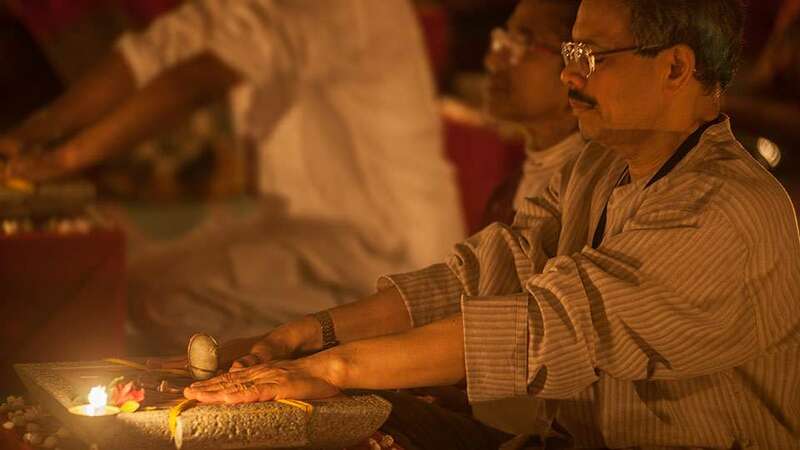 If people are living for their 'wants' then there is no use of spirituality for people like them and things like yantras that are used to satisfy their 'worldly needs' are just taking them a few steps away from spirituality making them more materialistic rather than bringing them back in to the spiritual path. Raja, is that the best explanation you can come up with to prove an opinion ? Surely you are very realized!!! It is because of people like you that fake gurus run their businesses so successfully. I am hoping Sadguru is not one of them and that is why I seek clarification. What is the price of the yantra? Is it affordable enough for the middle class people? 25,000 for a yantra. Way to go! Where does this all flow to? Just curious. I am a little curious about the yantra being offered. Isn't the aim of Isha is to get people discover the inner dimension? Why is then this open invitation for aiding in external material prosperity as per wishes of the recipient? Can someone who has received the yantra elaborate how it has helped them in achieving something they found hard to achieve earlier? Sadhguru do you think so many people would have purchased the yantra if the incentive associated was enlightment and not material gain? I am confused! On the one hand Sadguru always professes that he is against idol worship or going to temples or even about not being ritualistic and now he has built a temple and is talking of giving yantras to people to fulfill their materialistic desires. Also I understand that people are to take part in certain rituals if they have the yantra in their house. Isn't this not self-contradictory Sadguru? My question is out of benign curiosity and not out of any other malicious intent. 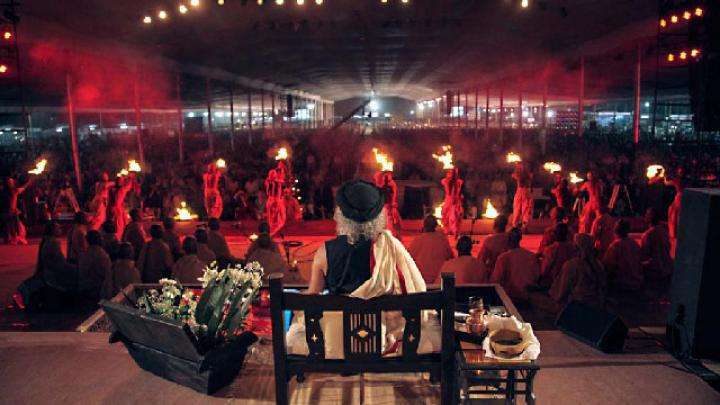 Sadhguru reveals the secret behind the architecture of the Dhyanalinga dome, created to be in harmony with the planet.